We make a trip to Monticello every Tuesday if weather permits and it does not land on a holiday. Our hours of operation for the mobile clinic in Monticello are 9:00 am to 4:00 pm. The clinic in Monticello fills up fairly quickly so call us as soon as you know you would like to be seen so we can make sure we get you in. 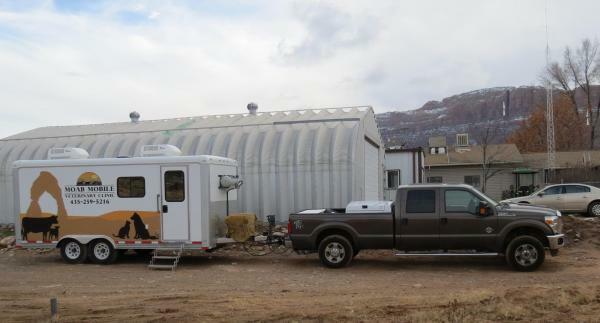 The mobile unit is located at the Monticello Fair Grounds, U.S. 491, Monticello, UT 84535. 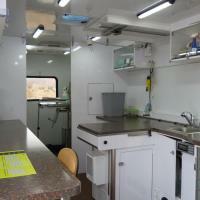 We are also capable of doing large animals at the mobile clinic, weather and facilities permitting. We also make a trip to Green River on the first Thursday of every month if the weather permits and if it does not land on a holiday. If the first Thursday of the month is a holiday then we will usually make up for it by coming the second week of the month. Our hours of operation in Green River are from 9:00 am till around 2:00 pm or 3:00 pm depending on how busy we are that day. The mobile unit is located right next to the Ace Hardware store in their side parking lot at 330 East Main Street, Green River, UT 84525. We usually do surgery in the morning and appointments in the afternoon. The surgeries will go home the same day and we ask you to pick them up by 3:00 pm in Monticello and by 2:00 pm in Green River. 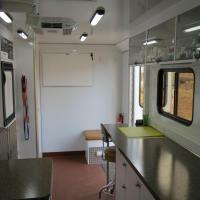 We can do almost anything on the mobile unit that we would normally do in our clinic in Moab, including surgeries, routine check ups, vaccinations, x-rays, and blood draws for lab testing. We stock most medications on the mobile unit but recommend calling in advance if you need a refill so we can ensure it is available on the mobile for you to pick up. We can also bring our Science Diet dog and cat foods. Need food brought down sooner? Ask about our new Hills to Home program for food delivery!